With our custom plug transplant program, you choose the plants and we do the growing. Provide us with organic and/or untreated, non-GMO seed (with a non-GMO verification statement) from sourced seed companies. Wozupi Tribal Gardens turns your seeds into plant starts, ready for transplant to your farm or market garden. We will grow trays of 128, 72 or 50 cells (your choice). Can I order a split or partial flat? No. We only sell full flats at regular price. Can I purchase more plants from your retail plant list? Of course! You may purchase our retail-ready plants at our retail-ready pricing online, over the phone, or by email. Do you offer additional flat sizes (besides 128, 72, or 50 cell trays)? Yes. 10-by-20-inch open flats of alliums can be custom-grown for on-site pickup only. No other tray sizes are available. Although we prefer online orders at wozupi.com, you can order by fax, email or phone. How do I provide proof of organic certification to my certifier? Our greenhouses are certified organic by the Midwest Organic Services Association (MOSA) and we are listed as an organic producer on MOSA’s website (mosaorganic.org). Organic status of our retail-ready plants are indicated on your invoice, too. We will provide a copy of our organic certificate to customers who need this verification. Plan your plant quantities, varieties, and field transplant dates per crop. Place your order with Wozupi Tribal Gardens and submit a down payment of 50 percent. 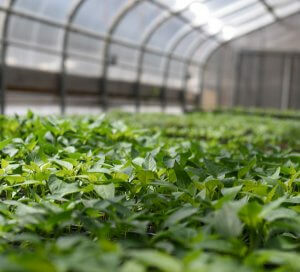 We seed your plants in the greenhouse, according to your pre-determined field transplant date. We confirm the date of delivery/pickup and request any remaining balance due. Requests for delayed shipment or pickup can be arranged at this time, for an additional $2 per flat per week with a 24-hour delayed pickup grace period. Either we ship your plants during your designated field transplant week or you pick them up on a pre-determined date. Then, you enjoy the fruits of less labor-intensive growing! We guarantee that all plants will be healthy upon shipment/pickup. Please see Terms and Conditions for more details. *Alliums are planted in February. You can pick up your plants at Wozupi Tribal Gardens Tuesday or Wednesday of your scheduled transplant week. All outstanding balances must be paid in full before pickup. Plant boxes can be purchased for $5 each at the farm that can securely hold three stacked plant flats. You can estimate $5 per flat or for every 5 bare root bundles of alliums and/or $15 per plant box that will hold 3 flats securely for shipment via Spee-Dee Delivery. Exact shipping fees will be calculated and invoiced accordingly. Pallet freight options are available for larger orders via Spee-Dee Delivery. You can estimate that a pallet fits 45 flats at a cost of $120-$150 per delivery location per full pallet ($2.66 to $3.33 per flat for a full pallet). We do our best to find you the most favorable shipping rates for your order. Rates listed above are estimates based on current fuel surcharges and Spee-Dee Delivery shipping rates. Your invoice will reflect actual shipping and handling costs at time of delivery. Meet our greenhouse manager—Andy Grotberg. He has 13 years of greenhouse management experience and has worked in medicinal herb and vegetable production for more than two decades. 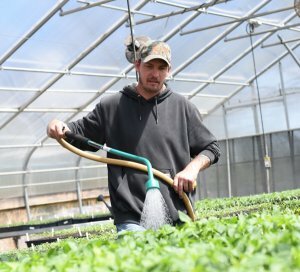 Andy takes great pride in the quality of his plants and management of our greenhouse program. He always ensures his plants leave the greenhouse healthy and ready to grow.